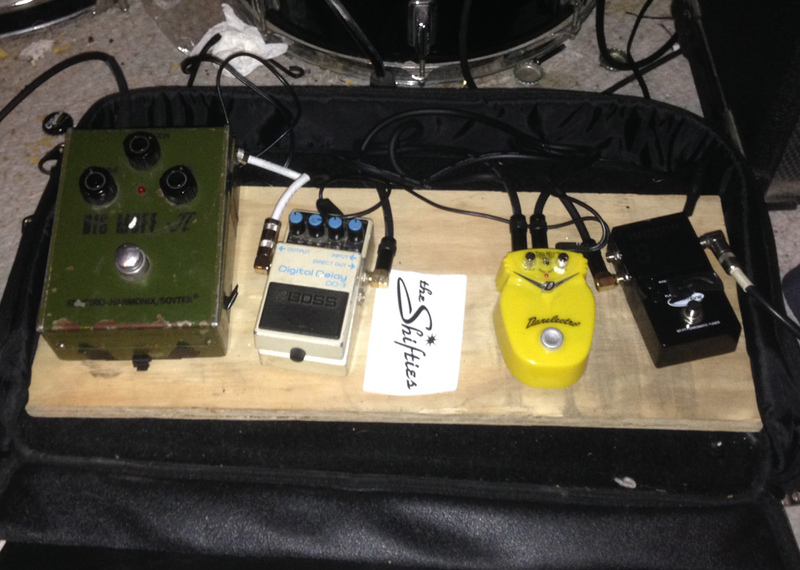 Today’s Pedal Line Friday submission is from Jeff Tudor. If you have a pedal line (doesn’t have to be in a board) for your rig, please email me a photo, bio, description of pedals and routing to pedalline@nulleffectsbay.com. Every Friday I’ll showcase a pedal line submission. Make sure you include any links to your band or music page. Hope you are having a great Holiday Season, I enjoy seeing other peoples set ups and learning about new effects pedals. trying them out. Ive gone to gear swaps and met with folks who make and repair pedals. I like Alchemy Audio here in Chicago, Jimmy has repaired my old Big Muff pedal and is always so cool to me. I have had a few pedals given to me over the years, and some I traded for bike parts when I was into BMX in Jr. high. (yellow Ibanez flanger) which I still have. but needs to visit Jimmy. I’ve entered a few contests, trying to win some new pedals or cables, I’m not a big effects user live, but i like to record and write songs with new effects. Here are the pedals I use most often. Big Muff Pedal – gift from my girlfriend(now wife) back in “94 because I was so into Siamese Dream – Mayonnaise at the time. and I used it on bass a lot for Beastie Boys Gratitude sounding fuzz. Danelectro – Tremolo pedal, seems OK, i cant seem to control it very well. or remember what speeds/depth for songs. but it was loaned to me by a guitarist who plays bass in our band, not sure if its really mine. so I’ve been on the hunt for a better tremolo solution. ModTone Tuner pedal was the cheapest one i could find, it may cause some weird pops every once in a while. may pull that out of the mix at some point. I tried out a TC Helicon vocal doubler pedal, i made lots of weird recordings with it, and annoyed band mates in practice, that’s about it. my kids love it. I also tried out an old Digitech RP10, its for sale on my reverb.com page. also found that in the rehearsal space. with no AC. found one online, had it at home for a while. made some recordings with it, but never remembered which settings i liked. the manual was too large. Midnight Amplification Devices and Ryan Adams - UpdateIf I had to create a mini pedalboard. Looking good, Jeff! It’s always an honor – even if you call me “Jimmy”. This just goes to show the pedal board does not make the band. Or maybe it does help make the sound. That muff is classic Indi Rock gold. The delay is classic and although I don’t go for it I think there are ardents. Dan Electro pedals are in my experience noisy and tone sucking. That said, The Shifties are excellent. I’m glad I followed the link. I need to get one of the albums. Ridiculous good price on the vinyl.